If you have not read part 2 of the travelogue yet, please read it before reading this one. March 3: I got ready at 6 am and made my way to Esfahan bus station at 7 am to catch my bus to Yazd. 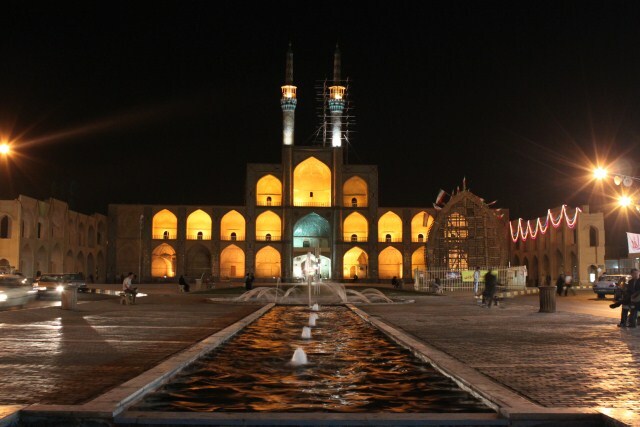 Yazd is another very significant city in Iran. Set in the middle of the desert, Yazd is 270 km south east of Esfahan. 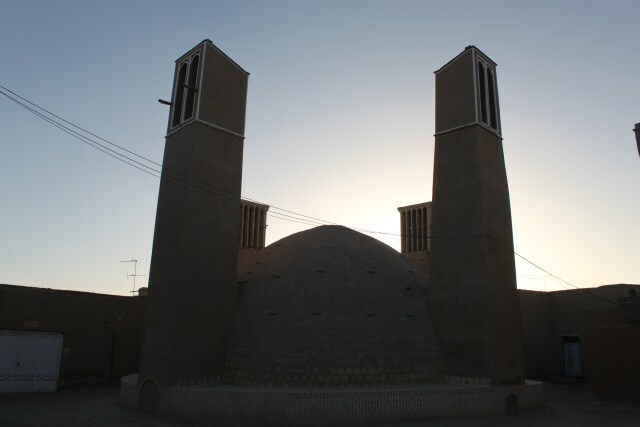 Yazd has been the center of Zoroastrianism for many centuries before the Islamic reign. The bus left at around 8 am. 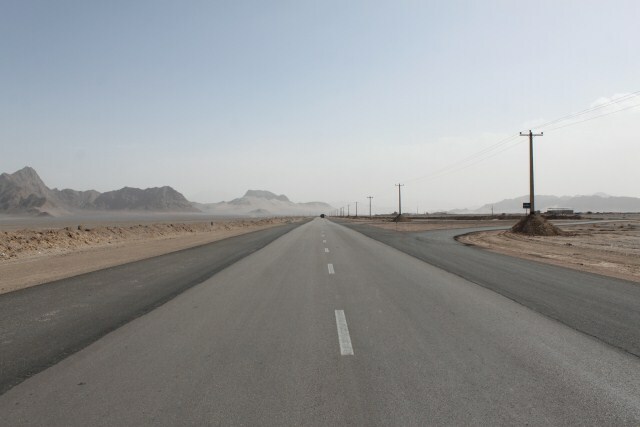 The scenery rapidly changed from the greenery of Esfahan to the desert plains of Dasht-e-Kavir. The road was exceptional as most roads in Iran were, and I reached Yazd by around noon time. 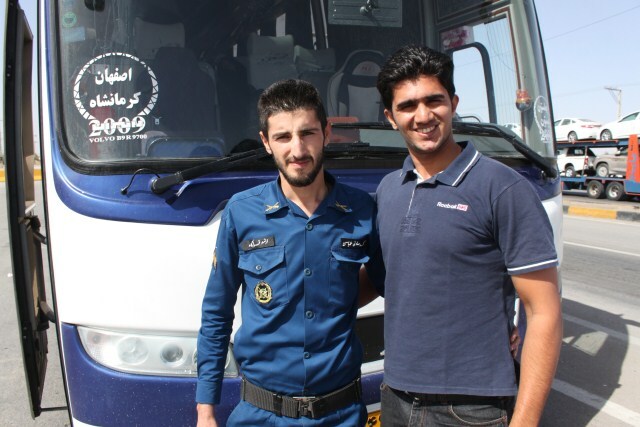 During the journey, I met a soldier from the revolutionary guards of Iran, who was a very friendly man. When the bus stopped, I looked outside the window to see nothing. There was nothing till the horizon. Then I looked to the other side and found a terminal there. The air was warm and dry. 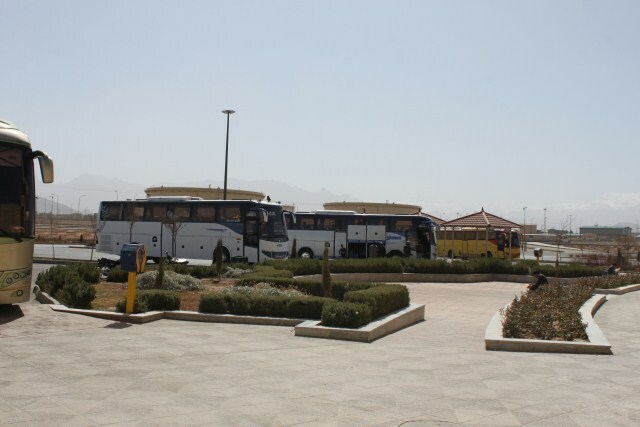 I freshened up at the bus terminal and just spent a few minutes soaking in the Yazd sun. The city has a history of over 3,000 years, dating back to the time of the Median empire, when it was known as Ysatis (or Issatis). The present city name has however been derived from Yazdegerd I, a Sassanid ruler. The city was a Zoroastrian centre during Sassanid times. After the Arab Islamic conquest of Persia, many Zoroastrians fled to Yazd from neighbouring provinces. By paying a levy, Yazd remained Zoroastrian even after its conquest, and Islam only gradually became the dominant religion in the city. Due to its secluded location, in the middle of the desert, it took the armies of Islam a long time to reach there. I’ll touch more upon Yazd and Zoroastrianism in a bit. For people familiar with Iranians in India, most Zoroastrians who fled to India to escape persecution were from Yazd and Shiraz. Yazdi bakeries are even today famous in Bombay, while Shirazi is a surname among Indo Iranians. I took a taxi to my host’s house in Yazd, Pooya and Goli. I am sure the distinct names of my hosts must have struck you. Welcome to Yazd…since we are moving farther and farther from the Arab world, the impact of Arab culture also decreases. This is clearly evident in the names of the Yazdi people, which are authentic Persian and not Islamicized to the extent on would expect (Mohammad etc.). It was a short ride to my hosts house. The town reminded me of a north Indian town, dusty, and low rise mud/brick homes that lent a red tinge to the environment. It was very clean though, unlike north-Indian towns. Pooya was home to welcome me. It was a nice bungalow, which had the landlords staying in the upper section, and Pooya staying in the lower section. His house was very well decorated and had a very Persian touch to it. After Meysam’s house, it felt like heaven! More Yazdi distinctness. 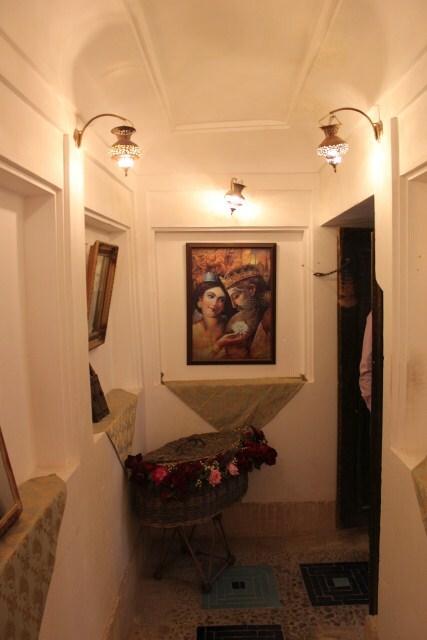 There were beautiful paintings of Cyrus and Mandana adorning the walls along with a lovely silver lined Fravahaar. Pooya offered me some tea and we spoke for some time. His personality was also very different from the Iranians I had met so far. He was a quieter person, warm but reserved. Ali Shahriarti, my guide in Esfahan had set me up with a guide in Yazd. After spending an hour with Pooya, I decided to do a walking tour of Yazd, since Yazd isn’t a very big place. Yazd is a small place. About half past noon, I walked up to the main square that was close to Pooya’s house. There, I met my guide; the man Ali Shariarti had setup for me. We decided to do a walking tour of Yazd, although we took a shared taxi to get to our first destination. First, we went to the marketplace… which was a dull place after all the lively markets I had seen so far. This was because it was mostly closed and also because it was Yazd, which isn’t particularly known for being colourful. My guide tried to arrange for keys to take me to the roof of the market area, but in vain. Then we went to a traditional restaurant within the market area. The restaurant also had a few very expensive but beautiful rooms for rent. The hosts showed me around patiently, even though they knew I wouldn’t be staying there. Again, there were lovely portraits of Cyrus and Mandana on the walls. This is a very significant feature. In Yazd, you are in the heart of the Zororastrian empire and culture, and also close to the erstwhile capital of Persepolis. Though Arab backed Islam had converted the population, the love and respect for the Zoroastrian rulers is still very much there in the hearts of the Yazdi (and Shirazi) people. The restaurant seating was a mix of traditional low cots with a dining area in the center, and also some table/chairs. People often take a nap in the restaurant after finishing their lunch, something which I love doing! I ordered for some kabab, rice, and some buttermilk. The food was really good. I asked for some water, thrice, but to no avail. Then, while clearing the bill, I asked for water at the cashier too; plain water. Instead, they gave me bottled water, which I did not want, and for the first time in the many days I had spent there, I felt a little ignored. Yazdi people are known to be frugal and not as hospitable as other Iranians. 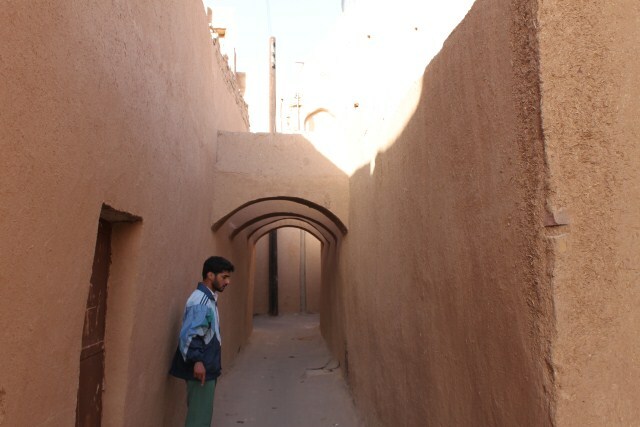 This is because life, over the centuries, has been very tough in Yazd due to the desert. Resources are limited and people tend to be a little miserly. After lunch, we moved through some lovely small alleys to a traditional house. The house was very simple, nothing like the ones in Esfahan or Kashan. My guide explained to me the various nuances of the place. We went to an underground chamber, which was directly connected to the old Yazdi canal system. Due to paucity of water, Yazd has a very old water storage and distribution system, which is underground to prevent vaporization. The houses of rich people, like the one we were in, were directly connected to the water grid for round-the-clock access to water. The we stopped by at a carpet warehouse and antiquity store. I bought a couple of souvenirs, after which we went to see the main mosque of Yazd, the Jameh mosque. 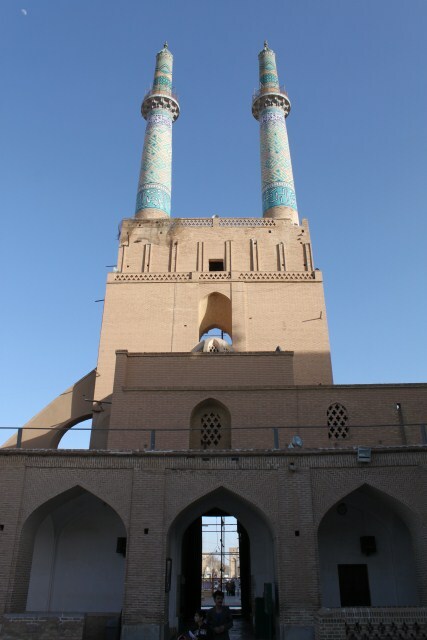 The mosque was a far more mellowed down version of the other major mosques in Iran. By this I mean that the architecture, and the use of color was simpler, in sync with the conservation and frugal style of Yazd. My guide told me a little about Shia Islam, which I knew about through my studies. He did make a good point though; he said that Shia Islam in Iran was almost like a answer or a manner of non-conformance to the Arab conquest (which in turn means Sunni Islam). We continued exploring the town as well as looking at the numerous Badgirs. Badgirs are a wind-based cooling mechanisms, common in Yazd and other desert towns of Iran, for keeping the homes cool. They work in a way similar to a modern day air-cooler. We then climbed up the roof of a house, which offered a lovely panoramic view of the town, with numerous Badgirs towering above the otherwise low skyline. We went to a restored post-office as well as an old compound. By evening we ended at the Takyeh Amir Chakhmagh Mosque complex, a semi-palatial structure in the heart of Yazd. It was a lovely square with a lot of activity around it. 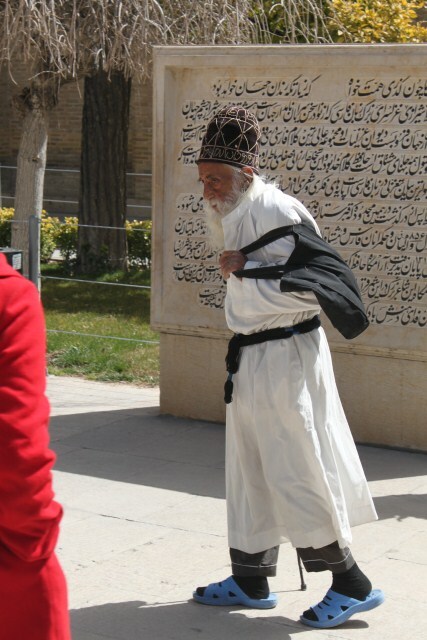 There were also some western tourists….very few of whom I witnessed in Iran. I had my dinner at a local pizza shop, and needless to say the food was excellent. I am not a big fan of pizzas, but the ones in Iran were the best I had ever had. Upon returning to my hosts, Pooya introduced me to their landlady and her daughter. They left after the bried encounter. Pooya and I spent some time chatting, with Goli serving some hot chai. Pooya also setup his friend, who drives a taxi, for tomorrow’s excursions. Pooya was also hosting a Spanish couple, who were cycling from Spain to China! They were away cycling for the last two days and returned to Pooya’s house this evening. I had a great conversation with them. They explained their planning for this epic trip and how they shaped up their lives around this dream. After Iran, they were going to cycle through most of central Asia and then into China. March 4: I was up and ready by 7 30 am. Goli had to leave early for work. Pooya and I had breakfast and his friend, whose name I struggle to remember, arrived. The plan for the day was to travel to small desert towns around Yazd called Chak Chak and Meybood, and possibly Ardakan. We left at around 9 30 am for Chak Chak. The village of Chak Chak also known as Pir-e Sabz, consists of a pir perched beneath a towering cliff face in the desert of central Iran. It is the most sacred of the mountain shrines of Zoroastrianism. 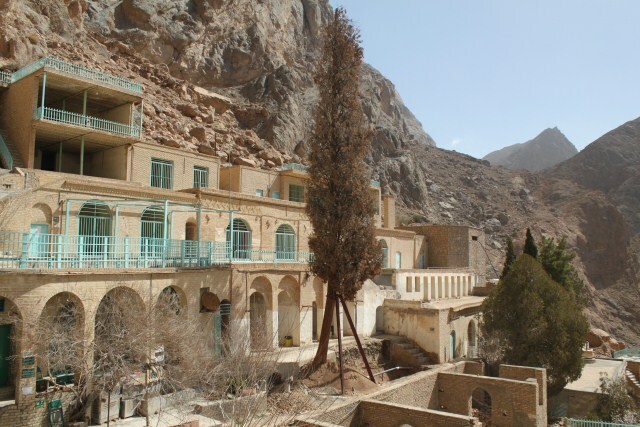 Located near the city of Ardakan in Yazd Province, Chak Chak serves as a pilgrimage point for pious Zoroastrians. Each year from June 14–18 many thousands of Zoroastrians from Iran, India and other countries flock to the fire temple at Pir-e Sabz. Tradition has it that pilgrims are to stop the moment they see the sight of the temple and continue their journey on foot the rest of the way. 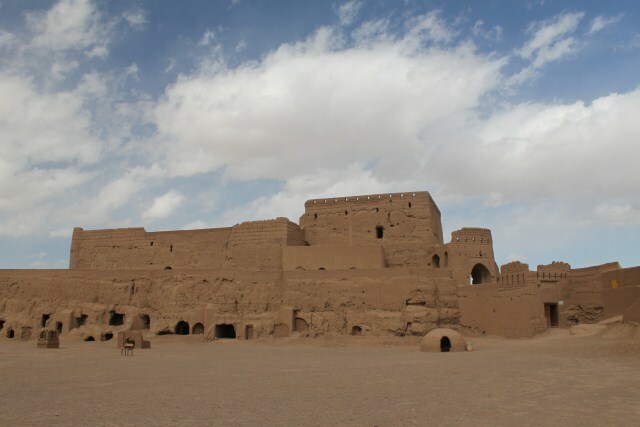 In Zoroastrian belief, Chak Chak is where Nikbanou, second daughter of the last pre-Islamic Persian ruler, Yazdegerd III of the Sassanid Empire, was cornered by the invading Arab army in 640 CE. Fearing capture Nikbanou prayed to Ahura Mazda to protect her from her enemies. In response to Nikbanou’s pleadings, the mountain miraculously opened up and sheltered her from the invaders. The terrain reminded me of Ladakh. It was a dry mountainous desert. The roads were fabulous. I stopped and squatted in the middle of the highway to take this picture. The fire temple was a perched in one of the hills; a twenty minute climb. This place is frequented by Zoroastrians from India and other countries during a certain festival. I met a few of them who were from Canada. The fire temple was a small cave like place with the history of the place featuring on one of the walls. Everyone had to wear the mandatory headgear before entering. I made a short video about the place, which will feature in my documentary. After a couple of hours there, we descended and left for Meybod, another old town in the region. It’s difficult to describe the scenery…it was so distinctly Iran or central Asian. I was loving it. Meybod is home to an old castle, one of pre-Islamic times. Very little is known about it or its history. It was made with red stone and looked similar to some of the desert structures that one might see in Rajasthan, India. I spent around an hour there, moving through the various chambers and ending up at the roof. It offered a magnificent view of Meybod, most of which consisted of low rise single storey structures. We left Meybod, but stopped at Ardakan to look at the pigeon house that Ardakan is famous for. It was made to house pigeons, hundreds of them. Not a very pretty sight, but a peculiar one. By evening, we left for Yazd. We had the option to go and see the Yazd fire temple, but I decided against it. Pooya’s landlady had prepared for dinner for all of us, which included the Spanish couple. Before the food, she and her daughter Mahaan serves us chai and dry fruits. Dinner consisted of mouth watering lasagna. It was clear to me now that Iran had something for Italian food and not just in restaurants! The conversations kept us busy till about 9 pm when we made our way to Pooya’s house in the basement of the building. I had a bus to catch for Persepolis, the glorious capital of Cyrus, at 11 pm. I wanted to undertake the night journey to save a day. Pooya and Mahaan dropped me to the bus station from where I boarded a bus for Shiraz. Persepolis is about 50 km before Shiraz so I had to get down from the bus on the highway at a place called Marvdasht. The journey was around 5 hrs. The bus was comfortable but for some reason, the cabin temperature was set to a sweltering 32 degrees, which made me feel very hot. Outside it bus, it was 0 degrees! March 4:I alighted at Marvdasht. It was cold. Very cold..and I was standing on a national highway with virtually nothing in sight. I had to walk around 500 meters in the cold to a lower spot on a road below. There, I found a near deserted taxi stand. Luckily, there was one enthusiastic taxi driver who was very happy to see me there! We agreed on a price to take me to Persepolis. It was VERY cold and I was having a tough time with my bags and stuff. The other problem was that it was only 5 am, and Persepolis would open for public at 9 am. We reached there at 6 am, and I had nothing to do for 3 hours, with virtually no place to protect myself from the cold. There was a hotel that was open. I almost sought asylum with them, and they obliged. I had some warm tea and a chocolate pastry. I just relaxed in the warmth of their reception area. 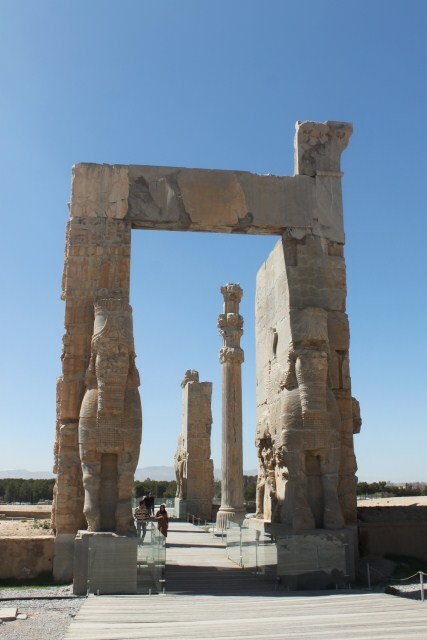 In a couple of hours, Persepolis was open! Persepolis, or rechristened by Arab invaders as Takht-e-Jamshid, was the glorious capital of the legendary Achaemenid ruler, Cyrus the Great. It was more of a statement than a city, of flamboyance, power, and culture. Some of you might also remember an animated movie about the life of a young girl in Iran by the same name. The great city was ransacked by another great, Alexander. Even after 2000 years, the ruins of Persepolis, give one an idea of what it must have been like at its heyday. A similar feeling to what one gets at Hampi, India, but this of course is much older. The entrance was through a wide passage, on the left of which was a good information counter. The staff had just come in, so I was really the only one there. There were good descriptions of the Achaemenid rulers, their kingdoms, and their culture. Significant stone reliefs written in ancient Persian (Cuneiform script) were translated for the benefit of the visitors. I spent some time there before moving to the two grand staircases which lead one to the elevated city. First, I marvelled at the Gate of All Nations, which had some remarkable stone work. Xerxes’s name was written in three languages and carved on the entrances, informing everyone that he ordered it to be built. Next was Darius’ Apadana Palace, the grandest of all structures and palaces at Persepolis. Its grandeur was evident even through the ruins. 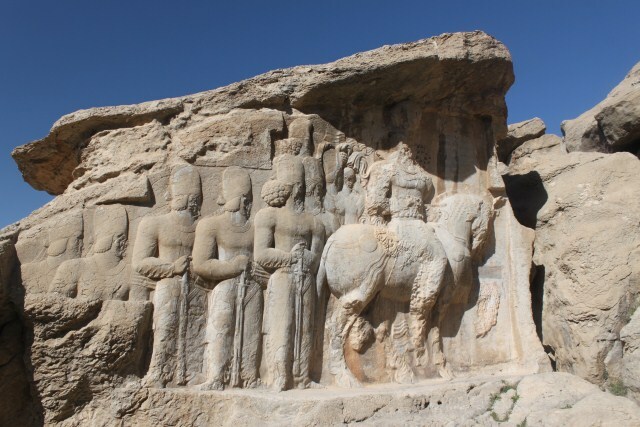 There were beautiful reliefs all around (it was slightly elevated) including some of Persian and Median soldiers with the Fravahaar prominently featuring in between. It is interesting to see a clear distinction between the Media(ans) and the Pars(is). For those who have a good understanding of Hindu/Sanskrit culture, numerous similarities between Zoroastrian/Persian culture become evident. Next to the palace was the 100 column palace of Xerexes and Artaxerxes. Only the column bases remain. A little behind the main structures, there was a hilly area, in which were the supposed tombs of Artaxerexes II and III. Achaemenid tombs were made into vertical mountain cliffs. The majority of tombs are at a nearby site called Naqsh e Rostam, which I will visit in a few hours. One missing link in my understanding of ancient Iran is that when and why did the transition from burying the dead to feeding to vultures (Towers of Silence, Parsis in India) happen? One last relief that I will mention is that of the immortal soldiers. The story is that the number of Achaemenid soldiers never decreased. Whenever a soldier dies, another one joined. This has been demonstrated in a relief. I spent another hour amongst the many other ‘less significant’ ruins. While exiting through the Gate of All Nations, I noticed some graffiti. On looking closely, I noticed that the graffiti was more than a century old, made by visiting soldiers of the British Indian Army amongst other gentlemen! There were Indian names too with 20th century dates. So we were the same back then as well! I exited the main complex of Persepolis and grabbed a quick bite before taking a taxi to Raqsh-e Rajab. Naqsh-e Rajab is an archaeological site just east of the ancient city of Istakhr and about 12 km north of Persepolis. Together with Naqsh-e Rostam, which lies less than a kilometer away, the site is part of the Marvdasht cultural complex. 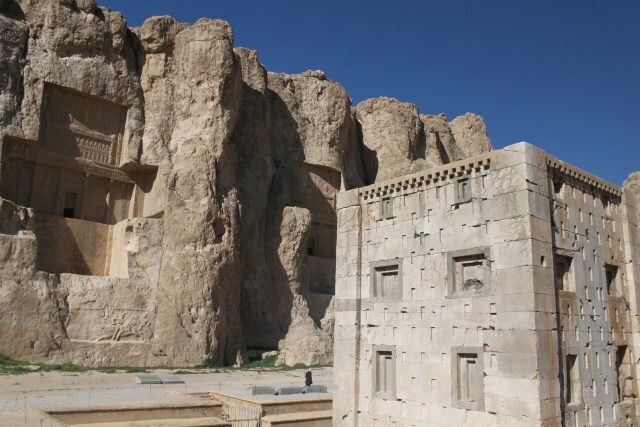 Naqsh-e Rajab is the site of four limestone rockface inscriptions and bas-reliefs that date to the early Sassanid era. One of the carvings is the investiture inscription of Ardeshir I, the founder of the dynasty. The second investiture inscription is Ardeshir’s successor, Shapur I. A third bas-relief, known as ‘Shapur’s Parade’ celebrates the king’s military victory in 244 over the Roman emperor Valerian I and Philip the Arab. A fourth bas-relief and inscription is attributed to Kartir, high priest under Shapur I and his sons Hormizd I and Bahram I. There was also the famous Ka’ba-ye Zartosht (the Kaaba of Zoroaster). The name Ka’ba-ye Zartosht probably dates to the 14th century, when many pre-Islamic sites were identified with figures and events of the Qur’ān or the Shāhnāme. The structure is not actually a Zoroastrian shrine, nor are there reports of it ever having been a pilgrimage site. 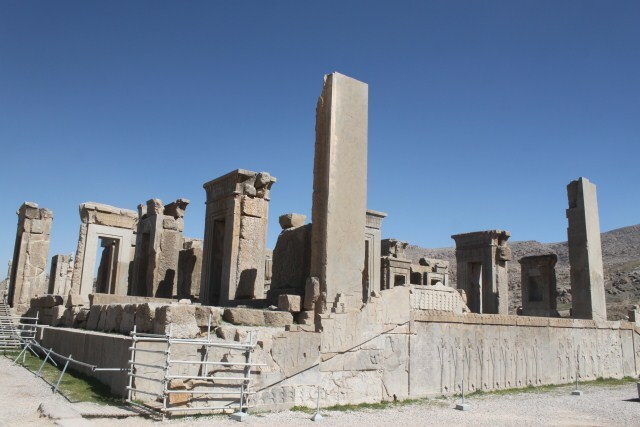 The structure, which is a copy of a sister building at Pasargadae, was built either by Darius I when he moved to Persepolis, by Artaxerxes II or Artaxerxes III . The building at Pasargadae is a few decades older. The wall surrounding the tower dates to Sassanid times. By afternoon, I had completed exploring all these places. I decided to skip Pasargade in the interest of time and took a bus to my last major destination in Iran, Shiraz. I reached Shiraz around 4 pm. It took me some time to find my host Hassan’s house, but it was worth the trouble, because it was a palatial house! Shiraz, the land of poetry and wine, was one of the capitals of Pars along with Istakhr, from the time of the Achaemenids. Today, it is still the capital of the Pars (Fars) province. Shiraz is most likely more than 4,000 years old. The name Shiraz is mentioned in cuneiform inscriptions from around 2000 BCE found in south western corner of the Shiraz city. According to some Iranian mythological traditions, it was originally erected by Tahmuras Diveband, and afterward fell to ruin. The oldest sample of wine in the world, dating to approximately 7,000 years ago, was discovered on clay jars recovered outside of Shiraz (according to the ref. article, this discovery was made in Hajji Firuz Tepe, a Neolithic village in Iran’s northern Zagros Mountains, more than a thousand kilometers north of Shiraz). In Achaemenid era, Shiraz was on the way from Susa to Persepolis and Pasargade. In Ferdowsi’s Shāhnāma it has been said that Artabanus V, the Parthian Emperor of Iran, expanded his control over Shiraz. Ghasre Abu-Nasr, which is originally from Parthian era is situated in this area. During the Sassanid era, Shiraz was in between the way which was connecting Bishapur and Gur to Istakhr. 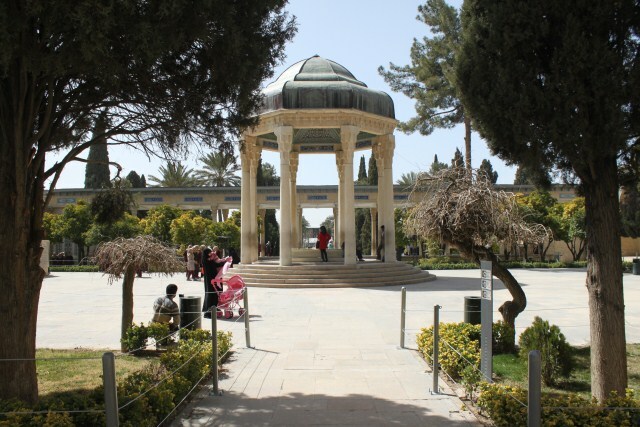 Shiraz is the birthplace of the co-founder of the Bahá’í Faith, the Báb (Siyyid `Ali-Muhammad, 1819–1850). In this city, on the evening of 22 May 1844, he first declared his mission as the bearer of a new divine revelation. For this reason Shiraz is a holy city for Bahá’ís, and the city, particularly the house of the Báb, was identified as a place of pilgrimage. Due to the hostile climate towards Baha’is in Iran, the house has been the target of repeated attacks; the house was destroyed in 1979, to be paved over two years later and made into a public square. My host Hassan and his wife Aarzoo welcomed me to their home. They had a lovely house as I mentioned. I had a room to myself, which was a luxury considering the fact that I was a CSer. I freshened up and started chatting with my hosts. Hassan was a businessman while Aarzoo was a housewife. They had two sons, one was teen-aged and one was very young. Aarzoo served us some tea and we started talking about all the usual stuff, from religion to politics, America to India. They were very bright and quite aware of facts, even though Iranian media and access to information is highly controlled. Hassan asked me what religion I was and I said I don’t have one, and he said…just like me a humanist! Aarzoo was a santoor player. Santoor is also another Iranian instrument which became very popular in Hindustani classical music of India. Their whole family was interested in some form of music or the other. Music and poetry are so deeply ingrained in Iran’s culture.. I rested for a while because I was very tired. In the evening, I just went for a walk around the neighborhood. Shiraz has the best weather of any Iranian city, cool and moderate all year long. It was clean and reasonably well-organized. I spent some time gazing at the lovely homes of the rich people in the neighborhood. In no time it was dark and I returned home. The conversations resumed and so did the food. Aarzoo was an excellent cook and kept serving us something or the other. For dinner, there was an assortment of Iranian dishes, some 4-5 of them. After dinner, Aarzoo played the Santoor for a while post which I retired to my room. I slept very quickly. March 5: I had today to see Shiraz. I was quite tired with all the sightseeing and travel, so I decided to restrict my day to only 2-3 places in Shiraz. Aarzoo served us some wonderful tea and breakfast, which included fresh bread along with jam, cheese, butter, honey and a couple of other tasty accompaniments. Hassan left early and so did the video game-addicted kids. I got ready and left for the tomb of Iran’s most famous poet Khwāja Shamsu Dīn Muhammad Hāfez-e Shīrāzī, known by his pen name Hāfez, was a Persian poet. His collected works composed of series of Persian poetry (Divan-e-Hafez) are to be found in the homes of most Persian speakers in Iran, as well as elsewhere in the world, who learn his poems by heart and use them as proverbs and sayings to this day. His life and poems have been the subject of much analysis, commentary and interpretation, influencing post-fourteenth century Persian writing more than any other author. The tomb was surrounded by a beautiful garden and fountain complex and had lots of visitors. Besides the tomb were the tombs of some other people, but because everything was written in Farsi, I am not really sure who they were. Hafez’s tomb had an art-filled canopy over it. There was beautiful work of art and stone on the roof as well as the floor. The idea of taking a picture with a tomb was a little weird for me, but nevertheless I clicked some photos of the tomb and the area. Hafez’s alabaster tombstone bears two of his poems inscribed upon it. The garden towards the rear side seemed more like a meeting place for young Iranian couples. There was a group of school children who were making their way in, so I decided to run! At the exit, a man with a parrot and a bunch of cards caught my attention. For a nominal feel, the parrot picks a card, which has a poem by Hafez on it and its inference for you. It was a nice memoir! After the tomb, I went to the famous Vakil bazaar of Shiraz, which was around the Vakeel mosque. 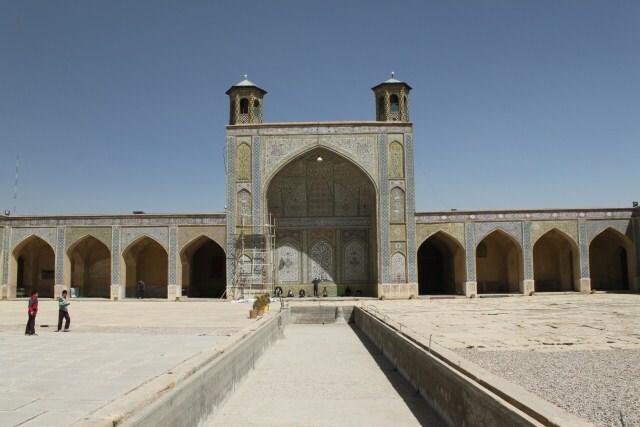 The mosque was built during the Shiraz based Zand dynasty’s rule and restored by the Qajars. The bazaar was full of carpets and textiles. There were also a number of shops selling copper-based handicrafts. I spent quite some time trying to capture the hustle-bustle of the bazaar through my lens, but don’t think I did justice to it. The mosque was similar to the one in Esfahan, but a little less decorated. I had seen enough mosques during the last week and only gave it a cursory glance from the inside. It was noon and Hassan called me home for lunch. On reaching home, I was surprised to see a handsome gentleman playing an Iranian drum like instrument. He was Aarzoo’s brother, whose name I forget at this moment. He was from the southern city of Bushehr, and was guess what? An archaeologist! Just what the doctor ordered. We had lunch and my conversations with the gentleman just wouldn’t stop, despite a major language barrier. After lunch, we split for some rest. In the evening, we went out with Hassan for a walk and I decided to skip the other monuments of Shiraz in favour of being home with these guys. Aarzoo’s brother and Hassan went out for some shopping and I remained home. I helped Aarzoo with preparing dinner, which included meat, shrimp, chicken and vegetables. Well, her brother was here and she was happy! In the evening, we spoke at length about Indo-Iranian history, culture, the spread of Islam in Iran etc. Aarzoo’s brother explained the various survey sites in southern Iran which are being excavated. I countered by saying that archaeology in Iran can never be complete because the Islamic government doesn’t want to see the glory of Iran’s pre-Islamic past. He reluctantly agreed. He told me his fascination for Indian wood work; probably referring to traditional work from Rajashtan and U.P. The whole family and I had dinner together. After dinner we indulged in some Iranian sweets, a lot of which were on the table. 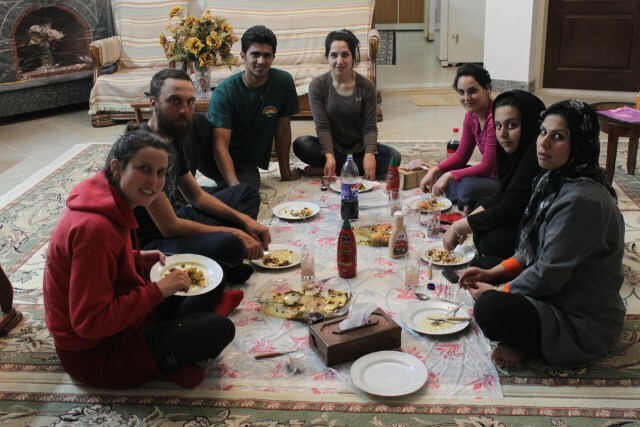 Iranian hospitality is something you’ll should witness to understand. We spoke almost till midnight after which we had another music session with both brother and sister playing their instruments. Then Aarzoo’s brother played the Setar as well, which he apparently was carrying with him. We slept at around 1 am. I was to leave for Tehran tomorrow morning. March 6: In the morning, Hassan ordered for taxi for the airport. I thanked my hosts for the wonderful time that I had with them and invited them to visit India. The airport was around 45 mins away and I was sharp on time, with not much room though. At the security check counter, I realized I had my sunscreen in my cabin bag, something which isn’t allowed. I told the security officer about it, and as soon as I said I am from India, he said no problem I can take it along. What a great feeling it is to be in a country which is NOT under perpetual security threats. The plane was on time and the attendants served me something to eat. I landed on time as well, which I will continue writing about in the last part of this travelogue. Hi, your write up on Persian heritage is a good read. Thanks a lot Ranjeeta. Please subscribe to my website to ensure that you get regular updates.